A good muffin recipe is hard to find. I’ve tried so many that resulted in dense, short, and tasteless muffins that I began to give up hope. Behold the King Arthur Flour recipe! 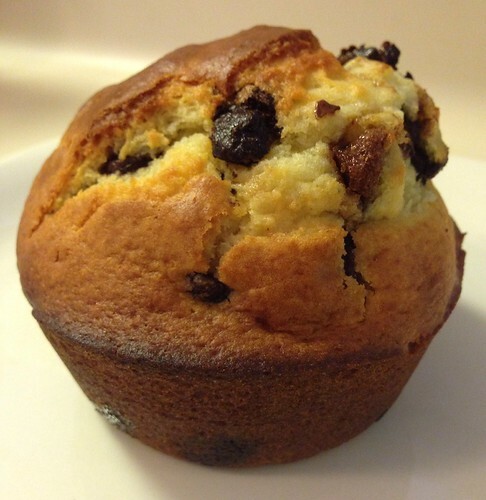 Not only are these muffins moist, domed, and filled with chocolate chips, they’re super easy to make. Eight ingredients and two bowls means easy baking and minimal cleanup. Plus, if you don’t like chocolate chips in your muffins (I’ll pretend you didn’t say that. ), you can easily swap them out for raspberries or another fruit. This recipe is really versatile and works with any kind of mix-in. Blend together the dry ingredients and chocolate chips. Beat the liquid ingredients (milk, oil or butter, and eggs) together until they are light. I used my OXO egg beater for this, and it worked perfectly. Pour wet ingredients into dry ingredients. Take a fork or wire whisk and blend the two for 20 seconds. The batter will be lumpy, but that’s fine. 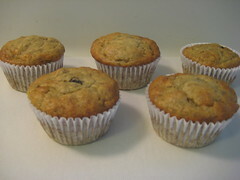 Fill cups of a lightly greased muffin tin two-thirds to three-quarters full. Place muffins in the oven and immediately drop temperature to 400°F*. Bake for 15 to 20 minutes, or until muffins test done. Yields: 12 muffins, 24 mini-muffins, or six jumbo muffins. I love everything brown sugar, and I especially love recipes that call for ingredients I already have on hand. Since this recipe met both of those points, I had a good feeling it would be love at first bite. Plus, Jenn has fabulous recipes and never lets me down! This recipe is no exception. 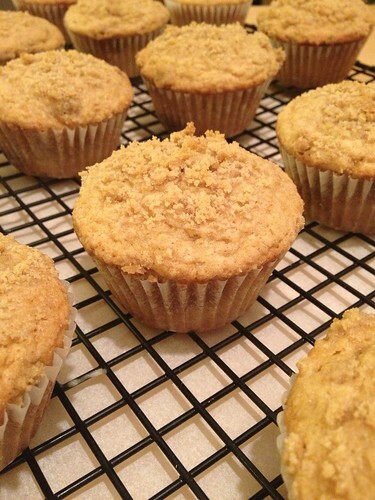 Soft, moist, sweet, and with a hint of cinnamon, these muffins are a delicious treat–for breakfast or dessert–and the crumb topping is the perfect touch. As Jenn suggests, these are amazing straight out of the oven, but if you’re not eating them right away, heat them in the microwave for a few seconds to warm them up. Make them now! Preheat oven to 375 degrees. Line a muffin tin with paper liners. In a small bowl, make the crumb by taking the flour, brown sugar and cold butter and cutting it up with a fork until it’s crumbly. Set aside. In a medium bowl, whisk the flour, brown sugar,white sugar, baking powder, baking soda, salt and cinnamon. Add the butter, eggs and buttermilk, and stir together until just combined. Spoon batter into the liners about 3/4 of the way full. Generously add the crumb topping on top of each muffin. Bake for 14 minutes, let cool on a wire rack for just a bit. I’ve read about how applesauce can be used in baked goods in place of fats such as eggs, oil, and butter but hadn’t tried the substitution until now. And I’m happy to report it’s a good substitution! 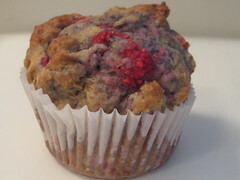 Of course, these muffins are not meant to replace my favorite banana bread. They are simply a low fat alternative, and even with the chocolate chips they are still only three points each. They’re easy (no need for a mixer! ), moist and flavorful, and lighter than I was expecting after reading some of the reviews. The lightness may be because I made muffins rather than a loaf (I like wrapping them individually then freezing them so I can defrost one at a time). I made the mistake of using paper liners, and the muffins completely stuck to them so I suggest spraying a muffin tin with Pam and forgoing the liners. Bake at 350 degrees for 13-15 minutes if making muffins (or 50 to 60 minutes if making a loaf), or until toothpick inserted into center of cake comes out clean. Yields 16 muffins or one loaf. Recipe adapted from Recipe Zaar. I bookmarked this recipe a couple years ago, after a friend sent me a link to a blog post about a food blogger who received an email from a reader asking for a refund because she tried this recipe on the blog and didn’t like it. I kid you not. These muffins are good–they’re moist, fluffy, and taste like a snickerdoodle, but look like a muffin. While they’re easy to make, they are a little messy but definitely worth it. And they’re also a nice change from everyday chocolate chip or berry muffins. Cream the butter and sugar until soft about 3 to 5 minutes. Add in the vanilla. Add in the eggs one at a time and mix until each is incorporated. In a separate bowl, mix together the flour, baking soda, baking powder, and cream of tarter. Add the flour mixture and the sour cream alternately to the egg-butter mixture in three additions. Start with the flour and end with the flour. Scrape the bowl occasionally. Using an ice cream scoop (I used a large cookie scoop), scoop out muffin batter one at a time and drop into a shallow bowl filled with the cinnamon sugar mixture. Roll the muffin around in the mixture until it is covered completely in cinnamon sugar. Place muffin into a greased muffin tin. Depending on the size of your tins, you should get about 12 to 14 muffins (I got 18). Bake them for approximately 20-22 minutes in a 350F degree oven or until they are golden brown. Recipe from Culinary Concoctions by Peabody. As I’ve mentioned before, I’m watching what I eat (I’ve lost 4 pounds thus far, yay!) and am always looking for good low(er) fat and low(er) calorie recipes that don’t have weird ingredients in them. Fortunately, I stumbled upon this recipe. 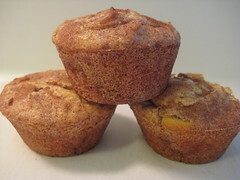 The muffins are moist, flavorful, filled with fruit, and only four points each! (Update: These got a thumbs down the next day from my family. Oh well.) Also, I found it interesting that the recipe calls for grinding the sugar (or in my case, Splenda blend) with the lemon zest. I think I may try that next time I make sugar cookies. Preheat oven to 400°F. Coat 12 large (1/2-cup) muffin cups with cooking spray or line with paper liners. Zest one lemon. (If you don’t have a Microplane zester, treat yourself to one!) Combine the zest and sugar in a food processor; pulse until the zest is very finely chopped into the sugar. Add buttermilk, oil, egg and vanilla and pulse until blended. Combine whole-wheat flour, all-purpose flour, baking powder, baking soda and salt in a large bowl. Add the buttermilk mixture and fold until almost blended. Gently fold in raspberries. 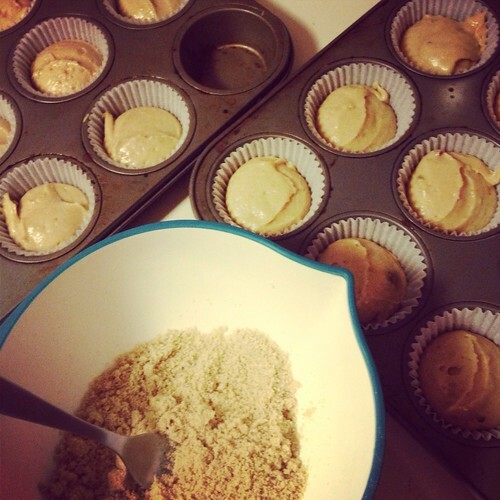 Divide the batter among the muffin cups. Bake the muffins until the edges and tops are golden, 20 to 25 minutes. (Mine took about 18 minutes.) Let cool in the pan for 5 minutes before turning out onto a wire rack. Serve warm. In blog news, you can now receive email updates of new blog posts!